Broadcom is introducing a new approach to Ethernet switch configuration that makes use of open source software to allow network hard vendors, OS vendors and even enterprise network managers to monitor, analyze, and provision switch resources through a standard software interface. This capability is enabled by a new Software Development Kit Logical Table (SDKLT) for Broadcom switch ASICs that leverages table-based programming, where all the device physical resources such as MAC Address Tables, L3 route tables, TCAMs, etc. are exposed as logical tables. Device-specific information is stored in databases and not embedded in the APIs. Device-specific behavior is managed by logical tables through a small set of APIs. Broadcom said this approach introduces new ways to monitor, analyze and provision switch resources, all through industry standard automation tools. The company is making this logical table programmability available as an open source SDK. 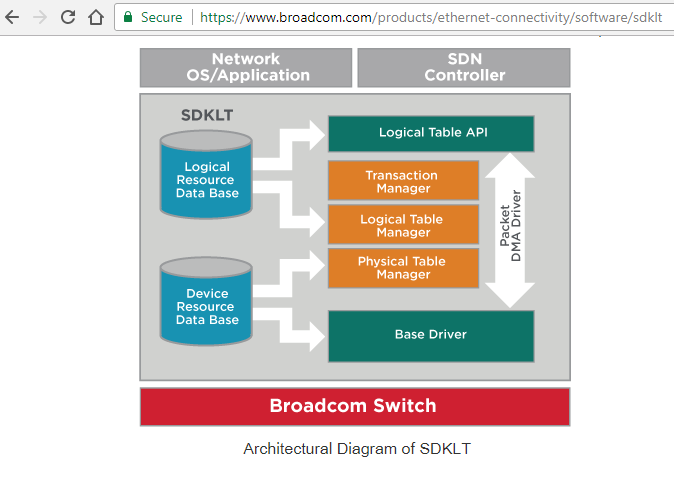 Broadcom's first open source offering of the SDKLT is for BCM56960 Tomahawk switch, which is widely used in data center top-of-rack (TOR) switches. The SDKLT open source code is posted on GitHub. The open source code and the Logical Table APIs are released under Apache 2.0 license. The software is designed for High Availability (HA) including support for Soft Error Recovery, Warmboot, and In Service Upgrades. “The SDKLT brings a fresh, state-of- the-art software development approach to the broader community of network software developers where they can now fully and directly control and monitor the rich switch feature set optimized for SDN and cloud use cases,” said Ram Velaga, senior vice president and general manager of switching products. AT&T announced plans to open source its Disaggregated Network Operating System project, or dNOS, which is a software framework for white box networking equipment. The project will now be hosted by The Linux Foundation. 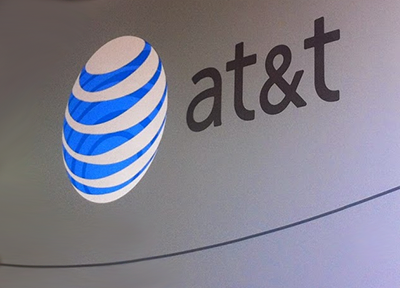 AT&T said dNOS makes it easier for software developers, network operators, cloud providers, hardware makers and networking application developers to create new white box products, such as open routers and switches. AT&T sees white hardware as a critical component of its network. 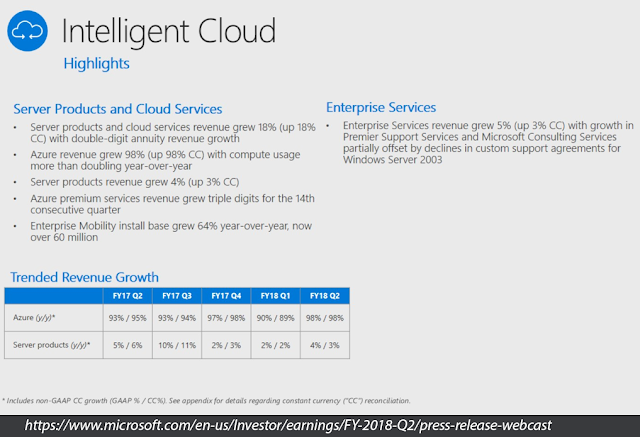 Microsoft reported revenue of $28.9 billion for the quarter ended 31-Dec-2017, up 12% over the same period a year earlier. Operating income was $8.7 billion and increased 10%. The company took a $13.8 billion GAAP charge in the quarter related to the tax reform. 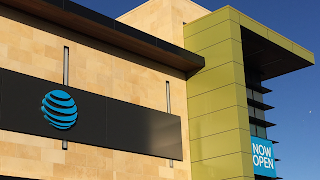 AT&T posted Q4 revenue of $41.7 billion, down slightly from $41.8 billion a year earlier primarily due to declines in legacy wireline services, wireless service revenues and domestic video, which were mostly offset by growth in wireless equipment and International. Fourth-quarter net income attributable to AT&T was $19.0 billion, or $3.08 per diluted share, and reflects the impact of the Tax Cuts and Jobs Act, compared to $2.4 billion, or $0.39 per diluted share, in the year-ago quarter. AT&T's full-year 2017 revenues amounted to $160.5 billion versus $163.8 billion in 2016. The company also confirmed plans to add $1 billion to its CAPEX budget in 2018 as a result of the tax reform legislation. 4.1 million total wireless net adds for the fourth quarter, including 2.7 million in U.S., driven by connected devices, postpaid phones and prepaid, and 1.3 million in Mexico. 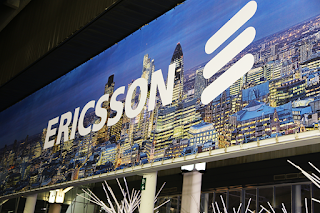 Following a review of its strategic options, Ericsson will spin off its Media Solutions business as an independent video technology company. One Equity Partners, a private equity firm with deep expertise in media and telecom investments, will acquire a 51% equity stake in the new company and Ericsson will retain 49% of the shares in the company. Media Solutions employees and contractors, as well as specified assets and liabilities, will transfer to the new company upon closing. Angel Ruiz will continue to lead Media Solutions as the CEO of the new company. In addition, Red Bee Media (Ericsson's former Broadcast and Media Services group) will continue to be developed as an independent and focused media services business. Legal separation from Ericsson is underway. Full-year 2017 adjusted operating income for Red Bee Media was SEK -0.3 b. 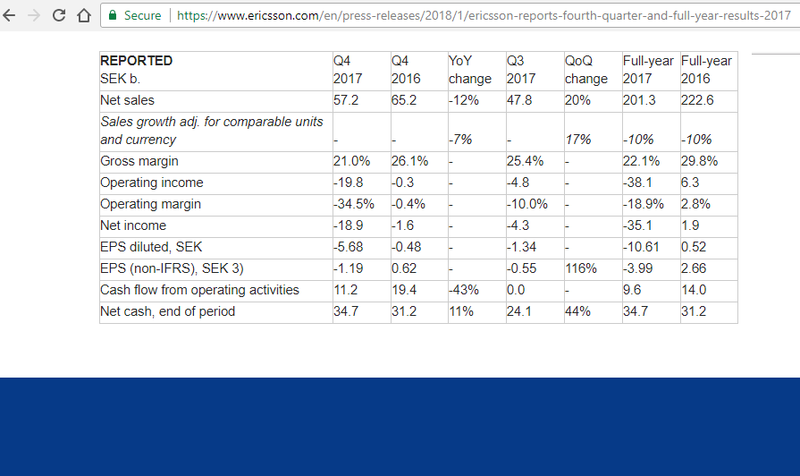 Full year revenues were SEK 2.5 b. Ericsson said cost and efficiency improvements should help improve the business. 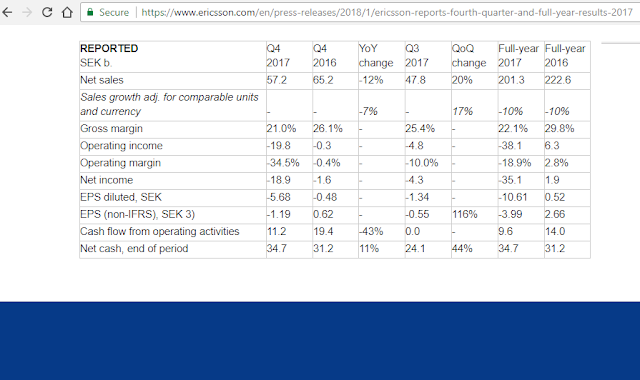 Ericsson's reported sales for Q4 2017 decreased by -12% to SEK 57.2 billion (US$7.26 billion). The figure was down 7% when adjusting for constant currency. Gross margin was 21.8%. Operating income was SEK -19.8 billion (-US$2.51 billion). Ericsson attributed the weaker performance to lower LTE sales in China. "During a challenging 2017, we have developed and started to execute on a focused strategy, strengthening our R&D while at the same time introducing robust measures to reduce cost and commercial risk. We have now laid the foundation for achieving our financial targets. The fourth quarter was in line with our overall expectation, with gradual improving performance in Networks and continued significant losses in Digital Services. The result is however far below our long-term ambition," stated Börje Ekholm, President and CEO of Ericsson. In its quarterly report, Ericsson noted that it has completed or exited 23 out of 42 under-performing managed service contracts, which should improve profitability. In terms of market opportunity, Ericsson expects the Radio Access Network (RAN) equipment market to decline by -2% for full-year 2018. Geographically, Ericsson forecasts the Chinese market to continue to decline due to reduced LTE investments, while it sees positive momentum in North America. Ericsson also announced the appointment of Åsa Tamsons as Senior Vice President and head of Business Area Emerging Business and member of Ericsson’s Executive Team. She joins Ericsson from McKinsey & Company where she has held the position as partner in McKinsey’s Stockholm office. In addition, Ulf Ewaldsson, currently head of Business Area Digital Services, and Elaine Weidman, currently head of Group Function Sustainability & Public Affairs, will step down. Ewalsson will take on a role as advisor to the CEO, while Weidman-Grunewald has decided to leave the company to pursue other opportunities. Jisc, which operates Janet – the UK’s world-class National Research and Education Network (NREN), is deploying Ciena’s 6500 packet-optical platform to enable 400G wavelength connectivity -- a world first for an NREN. “Our vision is for the UK to be at the forefront of scientific research. To make that happen, we must have a highly robust network powered with industry-leading technology that can scale to support bandwidth-intensive applications like genome editing and The Square Kilometre Array,” said Jeremy Sharp, Network Infrastructure Director, Jisc. “Working with Ciena, the Janet Network was the first NREN to provide 100G for users and, as demand has grown, is now the first to provide 400G. WaveLogic Ai enables us to operate efficiently and accurately engineer the network for optimal capacity to manage massive flows from new data-intensive research activities,” Sharp added. 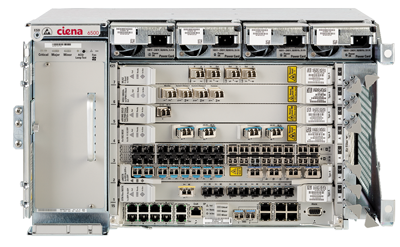 Verizon has selected Calix's AXOS E9-2 Intelligent Edge System to begin large-scale NG-PON2 deployments this quarter. 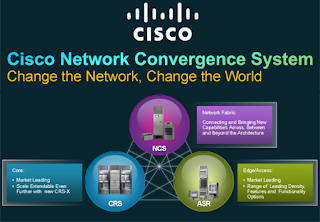 These deployments will include the AXOS RPm (Routing Protocol module for Layer 3) and the AXOS SMm (Subscriber Management module for disaggregated Broadband Network Gateway). Financial terms were not disclosed. 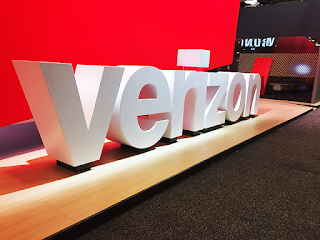 Calix said its NG-PON2 converged services platform enables Verizon to deploy a single access network for residential, business, and mobile services. 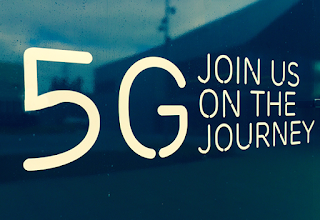 Nokia's Future X architecture for 5G, which the company is outlining this week and plans to showcase at next month's Mobile World Congress, will combine high-capacity 5G New Radio access, core networking capabilities, and SDN controlled 'Anyhaul' transport. The new architecture promises up to three times more data capacity per cell site and 30% lower total cost of operation through the artificial intelligence-based automation. Nokia AirScale Radio Access - a modular way to build radio access networks. Nokia plans 20 new products and features with software-upgradeable radios, including ReefShark-based products, and the smallest-ever outdoor AirScale system module. Nokia's 5G AirScale active antennas - optimized for mobility support, wide-area coverage, multi-gigabit throughput speeds and millisecond latency. New antenna products include AirScale massive MIMO Adaptive Antennas for 5G and LTE, a portfolio of new 5G ready radio heads, as well as a new dual-band Compact Active Antenna addressing all operator deployment scenarios. Nokia's 5G Small Cells - new 5G outdoor and indoor small cells will be compact and easily deployable and complement the 5G macro network. 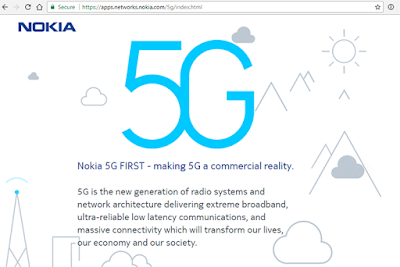 Nokia 5G Anyhaul - the portfolio is enhanced with SDN automation capabilities and products for Microwave, IP Routing, Optical Networking, and Next Gen PON, all supporting the migration of radio access and packet core functions to cloud architectures. 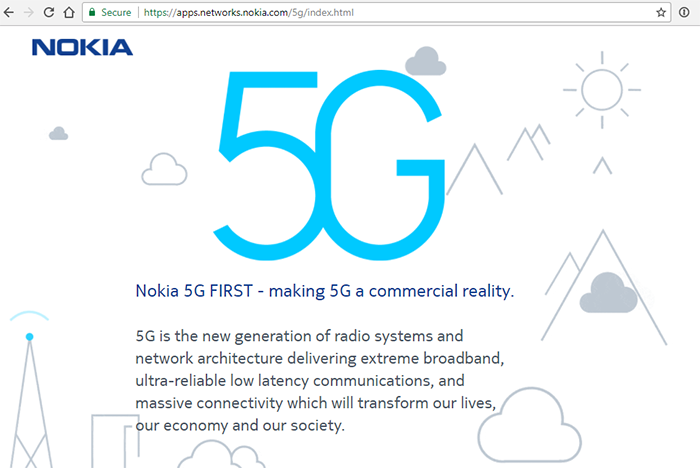 Nokia 5G Core - Nokia cloud-native packet core supports separated control and user planes and offers both virtualized and new physical deployment capabilities, including platforms built with Nokia's FP4 processor. Nokia's 5G core supports both wireless and fixed technologies. Nokia will also launch 5G registers to enable the management of subscriptions on the 5G network. Nokia also announced that it is working with 30 operators using ReefShark and will ramp up field deployments during the third quarter of 2018. Red Hat agreed to acquire CoreOS, a developer of Kubernetes and container-native solutions, for $250 million. CoreOS, which was founded in 2013 and is based in San Francisco, offers a commercial Kubernetes platform that let's customer build "Google-style" where workloads and applications placed in containers can be moved rapidly across clouds. CoreOS Tectonic is an enterprise-ready Kubernetes platform that provides automated operations, enables portability across private and public cloud providers, and is based on open source software. The company also offers CoreOS Quay, an enterprise-ready container registry. CoreOS is also well-known for being a leading contributor to Kubernetes; Container Linux, a lightweight Linux distribution created and maintained by CoreOS that automates software updates and is streamlined for running containers; etcd, the distributed data store for Kubernetes; and rkt, an application container engine, donated to the Cloud Native Computing Foundation (CNCF), that helped drive the current Open Container Initiative (OCI) standard. Red Hat said the deal furthers its vision of enabling customers to build any application and deploy them in any environment with the flexibility afforded by open source. “The next era of technology is being driven by container-based applications that span multi- and hybrid cloud environments, including physical, virtual, private cloud and public cloud platforms. Kubernetes, containers and Linux are at the heart of this transformation, and, like Red Hat, CoreOS has been a leader in both the upstream open source communities that are fueling these innovations and its work to bring enterprise-grade Kubernetes to customers. We believe this acquisition cements Red Hat as a cornerstone of hybrid cloud and modern app deployments,” stated Paul Cormier, president, Products and Technologies, Red Hat. In May 2016, CoreOS received $28 million in Series B funding round led by GV (formerly Google Ventures). Intel Capital participated in the round, as well as existing investors Accel, Fuel Capital, Kleiner Perkins Caufield & Byers (KPCB), Y Combinator Continuity Fund and others, bringing the company’s funding to date to $48 million. 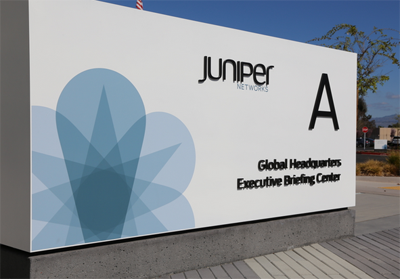 Juniper Networks reported net revenues of $1,239.5 million for Q4 2017, a decrease of 11% year-over-year and 1% sequentially, and also announced lowered financial expectations for Q1 2018 due to ongoing deployment delays as large cloud customers continue their architectural transition. Juniper said it remains confident in its competitive position and strong relationship with these strategic customers. On the earnings conference call, company execs said the weakness is primarily being driven by the shift to a scale out from scale up architecture, most notably at several of its largest cloud customers. For Q4 2017, GAAP operating margin was 16.4%, a decrease from 20.7% in the fourth quarter of 2016, and a decrease from 18.4% in the third quarter of 2017. Non-GAAP operating margin was 22.7%, a decrease from 26.5% in the fourth quarter of 2016, and a decrease from 23.5% in the third quarter of 2017. GAAP net loss was $148.1 million, a decrease of 178% year-over-year and 189% sequentially, resulting in diluted loss per share of $0.40. GAAP net loss was primarily due to the Tax Cuts and Jobs Act, which resulted in an estimated $289.5 million of tax expense. For full year 2017, Juniper's net revenues were $5,027.2 million, an increase of 1% year-over-year. GAAP operating margin was 16.9%, a decrease from 17.8% in fiscal year 2016. Non-GAAP net income was $809.0 million, flat year-over-year, resulting in diluted earnings per share of $2.11, an increase of 1% year-over-year. 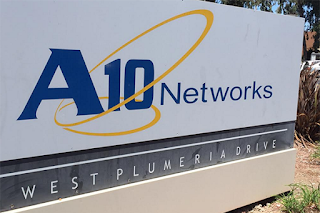 A10 Networks is postponing its quarterly earnings announcement, originally scheduled for Feb. 8, 2018, due to an internal investigation concerning a violation of its insider trading policy by a mid-level employee within its finance department. The company said its investigation did not identify matters that require material adjustments to be made, however, attention is now being focused on certain revenue recognition matters from the fourth quarter of 2015 through the fourth quarter of 2017 inclusive. Once the investigation is complete, A10 will schedule a conference call to discuss full financial results for the 2017 fourth quarter and full year. 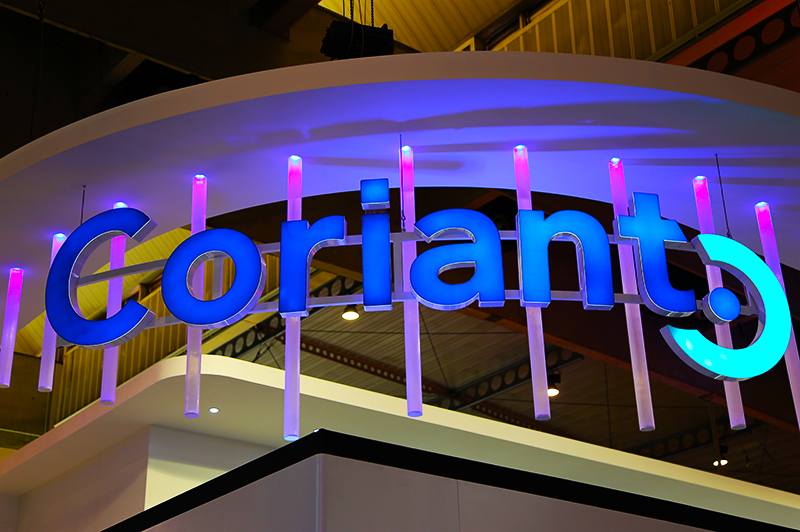 WorldStream, a leading Internet Service Provider in the Netherlands, has deployed the Coriant Groove G30 Network Disaggregation Platform to enhance the resiliency of its backbone network and scale transmission capacity to 100G per wavelength. WorldStream offers a wide variety of ISP and data center hosting services, as well as global connectivity. Internap, which provides high-performance internet infrastructure including colocation, managed services and hosting, cloud and high-performance network services, agreed to acquire SingleHop, private company headquartered in Chicago, Illinois for $132 million in cash. SingleHop is a managed hosting and infrastructure as a service (IaaS) provider offering automated and on-demand IT infrastructure. Henri Tervonen, CTO of Nokia Mobile Networks and head of R&D Foundation said: "With ReefShark, Nokia has created a clear competitive advantage. Its combination of power, intelligence and efficiency make it ideally suited to be at the heart of fast arriving 5G networks." Zayo agreed to acquire Neutral Path Communications, a long haul infrastructure provider operating a fiber network in the Midwest. The transaction will add 452 owned plus additional leased route miles to Zayo’s extensive North American network, including a unique, high-count fiber route from Minneapolis to Omaha. The assets are highly complementary to Zayo’s Midwestern long haul dark fiber footprint. The deal was valued at $31.5 million. Zayo said the acquisition enables it to sell multi-city dark fiber and fiber-based lit solutions from Minneapolis into Omaha, extending to Denver, Kansas City, Tulsa, Dallas, Des Moines, Chicago and other major markets. Aquantia confirmed that its new products deliver the 10Gbps Ethernet connectivity for the NVIDIA DRIVE Xavier and DRIVE Pegasus platforms for autonomous vehicles. NVIDIA's DRIVE Xavier processor parses all the information to understand a full 360-degree perception around the vehicle and determine the presence and movement of pedestrians, other vehicles and objects as it plans a safe path forward. The Aquantia Ethernet products communicate the data and decisions back and forth throughout the system at 10Gbps over automotive Ethernet cables. Earlier this month at CES, Aquantia announced a partnership with Molex, which has developed a 10 Gbps Automotive Ethernet Network solution for connecting Electronic Control Units (ECUs) throughout a vehicle. The Molex Automotive Ethernet solution uses Aquantia's new silicon. 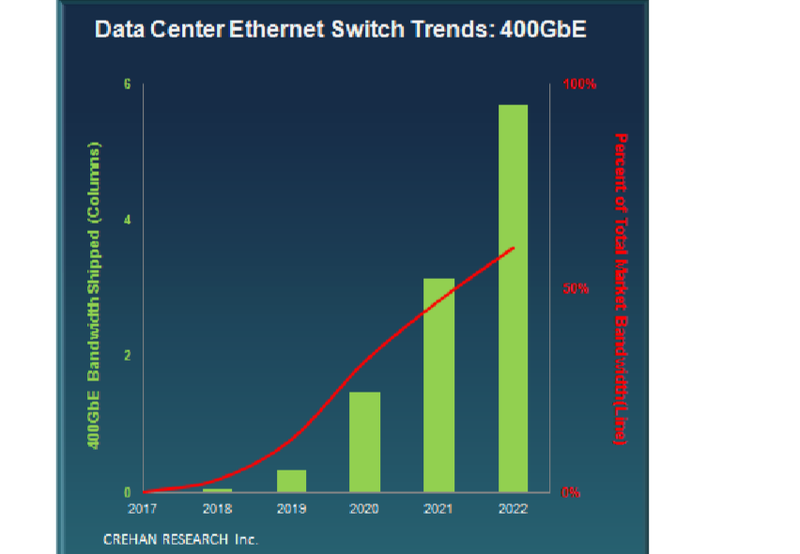 Expect to see initial shipments of 400 gigabit Ethernet (GbE) switches this year and look for exponential growth ahead. 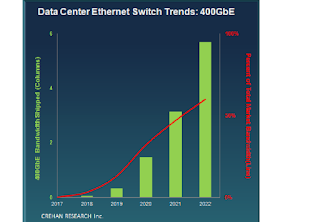 The 400 GbE technology will drive the majority of data center Ethernet switch bandwidth by 2022, according to a newly published Data Center Switch Long-Range Forecast Report from Crehan Research Inc. The Small Form Factor Pluggable Double Density (SFP-DD) Multi Source Agreement (MSA) Group released an updated specification for the SFP-DD pluggable interface. An initial version was released in September 2017. This update (version 1.1) reflects enhancements to the mechanicals and drawings of the high-speed, high-density SFP-DD electrical interface comprising a module and cage/connector system targeting support up to 3.5 W optical modules in an enterprise environment. The SFP-DD MSA Group was formed last year to foster the development of next-generation SFP form factors used in DAC and AOC cabling, and optical transceivers. The electrical interface is designed to support two lanes that operate up to 25 Gbps NRZ or 56 Gbps PAM4 per lane modulation—providing aggregate bandwidth of 50 Gbps NRZ or 112 Gbps PAM4 with excellent signal integrity. In combination, an SFP-DD server port and QSFP-DD switch ports can effectively double port density in network applications. SFP-DD MSA founding members include Alibaba, Broadcom, Cisco, Dell EMC, Finisar, Hewlett Packard Enterprise, Intel, Lumentum, Mellanox Technologies, Molex, and TE Connectivity. You don’t want to miss IEEE WIE ILC 2018 in San Jose, California where leaders from around the world will gather to inspire, engage and advance women in engineering! 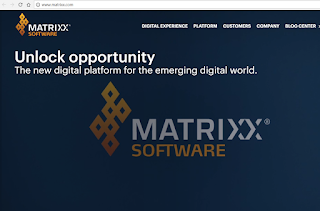 MATRIXX Software, a start-up based in Saratoga, California announced $40 million in Series C funding for its next-gen digital commerce platform for telco and related industries. MATRIXX Software’s Digital Commerce platform aims to reinvent telco business support systems by bringing together typically separate applications for product design and lifecycle management, customer engagement, service delivery and monetization into a single, comprehensive platform. The company reports 130 percent year-over-year growth, adding new customers across North America, UK, Europe, Middle East and Asia. 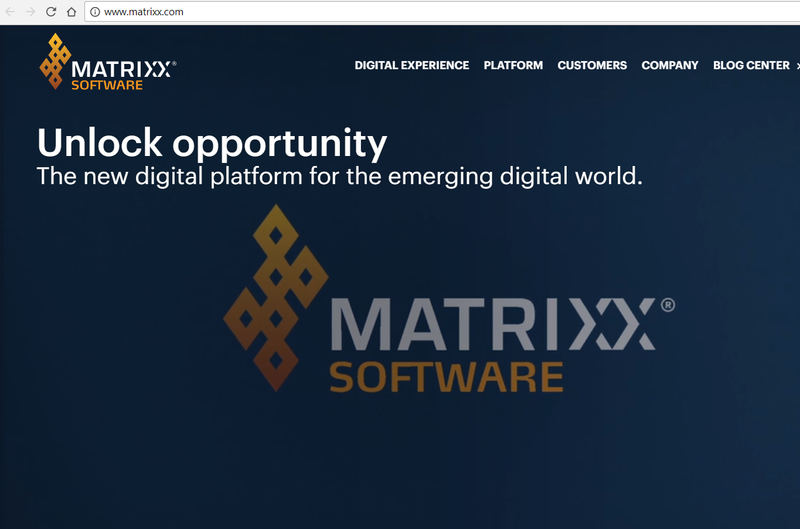 “We founded MATRIXX on the principles of digital scale and agility. We design software with both the Telco and the end consumer in mind to deliver capabilities that will provide valuable and meaningful change to the way Telco’s operate,” said Dave Labuda, founder, CEO and CTO of MATRIXX Software. The funding round was led by Sutter Hill Ventures. Additional new investors include Spring Lake Equity Partners and strategic partner CK Hutchison, whose 3 brand group of telecommunications operators serve over 130 million customers globally. The round also includes existing investors and strategic partners Greylock Partners, Adams Street Partners, Telstra Ventures and Swisscom Ventures. National Security Council officials in the Trump administration are considering a federal role in building and operating a national 5G network, according to a report by Axios based on a leaked Powerpoint and memo. The idea is to develop a secure, nationwide 5G network at the federal level to stave off security concerns from China. The nationalized infrastructure would then be leased to mobile operators. The report has drawn immediate criticism across the board. FCC Chairman Ajit Pai: "“I oppose any proposal for the federal government to build and operate a nationwide 5G network. The main lesson to draw from the wireless sector’s development over the past three decades—including American leadership in 4G—is that the market, not government, is best positioned to drive innovation and investment. What government can and should do is to push spectrum into the commercial marketplace and set rules that encourage the private sector to develop and deploy next-generation infrastructure." Rambus reported quarterly revenue of $101.9 million, 4% higher than a year ago, with GAAP diluted net loss per share of $0.29 and non-GAAP diluted net income per share of $0.19. Total revenue for the year ended December 31, 2017 was $393.1 million, 17% higher than a year ago. The company also announced changes in its accounting practice regarding the way revenue from licensing its intellectual property will be recognized. “Rambus has transitioned to focus on two key high-growth markets - the data center and the mobile edge - with a product roadmap that leverages our core competencies and key ingredient technologies to both differentiate and accelerate our position in complementary markets,” said Dr. Ron Black, chief executive officer of Rambus. Much new and needed subsea capacity is going into Atlantic waters this year. This new capacity will be essential to Internet Content Providers, public cloud companies, and mobile operators as they push into 5G. 2018 opened with the unveiling of HAFVRUE (mermaid in Danish), a massive subsea cable project that will link New Jersey to the Jutland Peninsula of Denmark with a branch landing in County Mayo, Ireland. Optional branch extensions to Northern and Southern Norway are also included in the design. The Mermaid cable has a theoretical design capacity of 108 Tbps, which will make it one of the high-capacity subsea cables ever built. TE Subcom has been signed as the system supplier for HAVFRUE. The construction contract is now in force and the marine survey is underway. A ready-for-service date is promised in Q4 2019 – less than 24 months away. The HAVFRUE subsea cable system will be optimized for coherent transmission and will offer a cross-sectional cable capacity of 108Tbps, scalable to higher capacities utilizing future generation SLTE technology. What is most interesting about the Mermaid project is the diverse membership of the consortium, especially the inclusion of Facebook, Aqua Comms and Bulk Infrastructure as key members. Perhaps it's not too surprising to see Facebook on this list, even though they must be one of biggest owners of transatlantic bandwidth at the moment. After all, Facebook, along with Microsoft, is co-owner or the newly commissioned MAREA cable system, which spans 6,600 km from Virginia Beach, Virginia to Bilbao, Spain. The MAREA cable has a record 160 Tbps design capacity using eight fibre pairs. However, MAREA takes a more southern route than other transatlantic cables, which mostly connect northern Europe to the New York/New Jersey region. MAREA’s Virginia landing makes a good connection point to Facebook’s 160-acre data centre campus in Forest City, North Carolina. Perhaps there are plans for a Facebook data centre in southern Europe, given that the company’s current European facilities are all north. The social media giant famously activated its first European data centre in in 2013 in Lulea, a city on the coast of northern Sweden, where the sub-Arctic climate and cheap hydroelectricity were seen as especially advantageous. In January 2016, Facebook selected Clonee (a suburb of Dublin), Ireland as the location for its second data centre in Europe. (Facebook’s international headquarter has been in Ireland since 2009). One year later, in January 2017, Facebook announced its selection of Odense, Denmark as the location for its third European data centre. The company said Denmark was chosen for its robust Nordic electric grid, access to fiber, access to renewable power, and a great set of collaborative community partners. Renewal energy is expected to account for 100% of electricity needs. Given these two new data centres in Ireland and Denmark, it makes sense that Facebook would invest in a new transatlantic cable landing in these two countries. For Aqua Comms, which is a young, subsea cable operator based in Dublin, the new HAVFRUE cable also adds to its growing existing transatlantic portfolio. It was only two years ago, in January 2016, that Aqua Comms’ AEConnect Cable System went into operation. 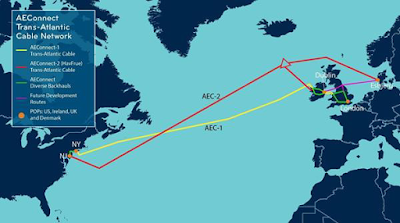 The AEConnect cable spans more than 5,400 km across the Atlantic between Long Island, NY and Killala, County Mayo, on the west coast of Ireland. Its design capacity is 130 Tbps, or 130 wavelength services at 100Gbps per fibre pair. Aqua Comms’ first cable project was CeltixConnect, a 72-fibre pair subsea cable connecting Ireland and the UK that entered service in January 2012. With this new HAVFRUE cable, Aqua Comms has been appointed system operator and landing party in the U.S., Ireland, and Denmark. The company plans market and sell capacity services and raw spectrum on its portion of the HAVFRUE cable system under the brand name America Europe Connect-2 (AEC-2). Aqua Comms will also commission a new cable route to Denmark through the UK, developing CeltixConnect-2, which connects Dublin to Manchester, as well as the North Sea Connect cable that will link Stellium’s data centre in Newcastle, England, to Esbjerg, Denmark. The new HAVFRUE cable not only adds capacity for Aqua Comms, it also enables the company to create a resilient, ring-based infrastructure between the East Coast of the U.S., Ireland, and Northern Europe that is especially attuned to hyperscale cloud companies needing dozens of 100G transatlantic circuits in the years ahead. In the south Atlantic, Seaborne Networks has been building a new generation of subsea cables. In September 2017, Seaborn activated its Seabras-1 direct subsea system between New York and São Paulo while bypassing the hurricane-prone areas of Florida, the Caribbean and Bermuda.. The new Seabras-1 submarine cable, which spans 10,600-km,, has multiple branching units and is designed to provide additional route diversity to Virginia Beach, Miami, St. Croix, Fortaleza, and Rio de Janeiro. Seaborne is planning a new direct subsea system between Brazil - Argentina (RFS Q4 2018); and SABR, a new subsea system between Cape Town, South Africa and Seabras-1 (RFS 2019). Interestingly, Seaborn and Aqua Comms have just announced a strategic alliance to provide subsea connectivity between South America and Europe. This looks to integrate Seaborn’s Seabras-1 subsea cable system now directly interconnects with Aqua Comms’ America-Europe Connect (AEConnect) subsea cable network. The two submarine cable systems will interconnect in Secaucus, New Jersey, in the location of Seaborn’s primary network operations centre. SES confirmed that four new O3b satellites have arrived safely at the Guiana Space Centre in Kourou, French Guiana, in preparation for launch by a Soyuz vehicle in March 2018. The new satellites, which will be placed into orbit at a distance of 8,000km, will augment SES’s fleet of 12 O3b satellites. The new satellites were built by Thales Alenia Space and will enable SES Networks to offer more capacity, enhanced coverage, increased efficiencies and greater reliability while delivering carrier-grade services including MEF Carrier Ethernet 2.0 certified services, to telcos, mobile network operators (MNOs), enterprises, internet service providers (ISPs) and government customers. 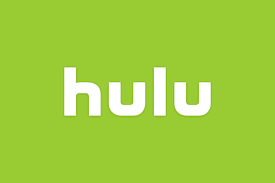 Hulu is moving from its existing data centers to a new colocation facility in Las Vegas operated by Switch, one of the largest renewable energy-powered data center providers. The new, 100 percent renewable energy facility spans 2.4 million square feet across 12 buildings. A posting on Hulu's tech blog said the new facility provides better reliance to natural disasters and ensures a greener and more sustainable system for streaming content to its millions of viewers. The company also noted that its Live TV service operates on the Amazon Web Services platform. The Switch data center also provides a stable, direct connection into AWS. Reliance Communications has stated that its plans to self-finance its recently-announced, state-of-the-art express cable network which will extend from India via Thailand to Hong Kong and from India across the Middle East to Italy. The vision is to create a Next-Generation IP and Cloud environment across the emerging markets corridor that encompasses the Middle East into Europe, as well as the large economies of China, India and Indonesia. The Eagle cable system, targeted for completion by the end of 2020, will be four/six fiber pair systems, with an initial design capacity of 12-24Tbps per fiber pair, using Next-Generation Coherent Submarine Fiber. Reliance Comm's Global Cloud Xchange (GCX) has also entered into key partnerships to expand its Cloud ecosystem and data center footprint, further solidifying India’s position as a key global hub with a strategic edge in the next wave of technology growth and expansion across emerging markets. GCX owns the world’s largest private undersea cable system spanning more than 67,000 route km which, seamlessly integrated with Reliance Communications’ 200,000 route km of domestic optic fiber backbone, provides a robust Global Service Delivery Platform. 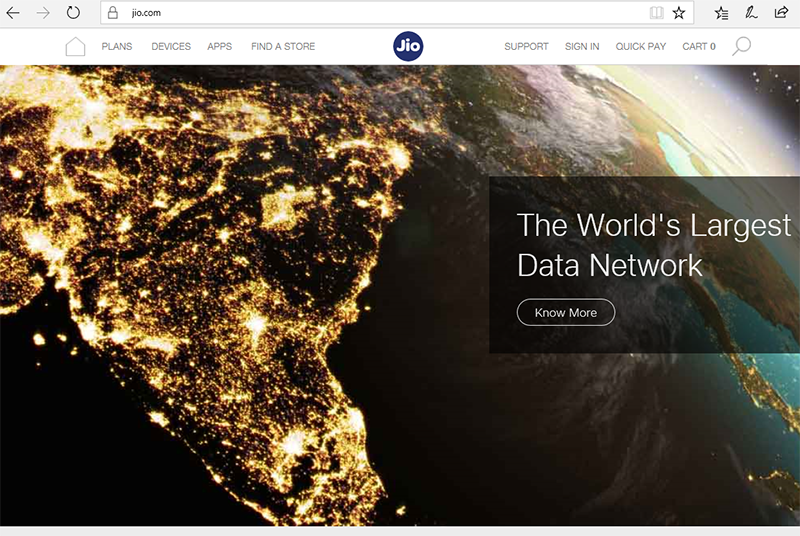 Earlier this month, Reliance Jio Infocomm, the fastest growing mobile operator in the world and which is a subsidiary of Reliance Industries Limited, agreed to acquire specified assets of Reliance Communications Limited and its affiliates. Mitsubishi Electric Corporation has developed an autonomous platform that enables networked smart appliances without the need for cloud computing or internet connection. The platform, which leverages a lightweight software library that requires memory space of just around three megabytes and which can be run even on low-spec microcontrollers, is expected to facilitate a wide variety of cooperative smart appliances and related services. 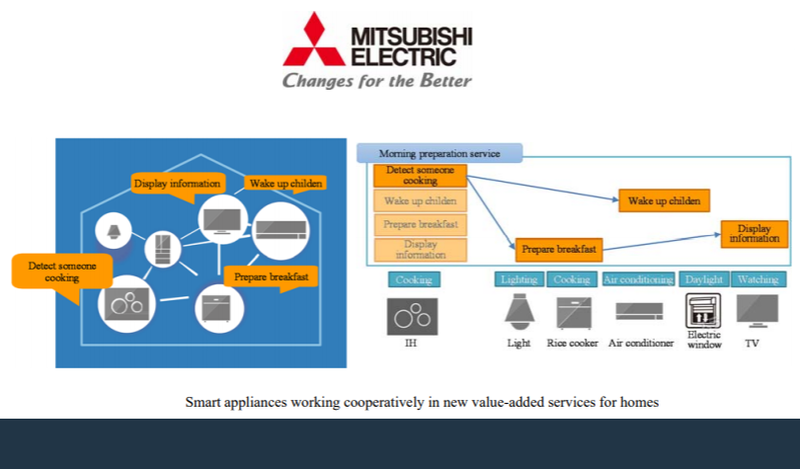 Mitsubishi is aiming for commercialization of the platform by 2020. Several patents are pending. 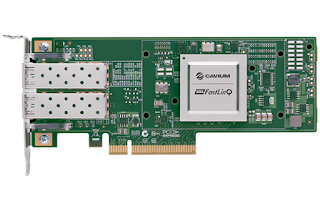 Cavium cited market momentum for its family of FastLinQ 10/25GbE Ethernet NICs, which are now powering HyperConverged Infrastructure (HCI) solutions from Microsoft Windows Storage Spaces Direct, VMware vSAN, and HPE SimpliVity. The company says it has shipped millions of Ethernet ports in its FastLinQ 10/25GbE family. 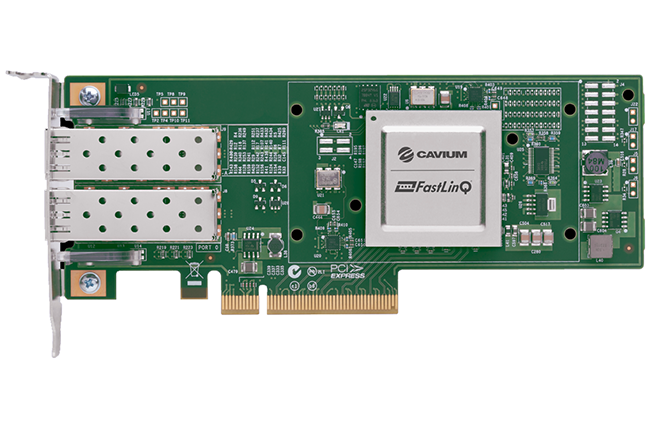 Cavium announced the introduction of the FastLinQ 41000 Series products, its low power, second-generation 10/25/40/50 Gigabit Ethernet NIC that is claimed to be the only such adapter to feature Universal RDMA. Steve Smith has resigned as CEO of Equinix. The company cited "poor judgment with respect to an employee matter." 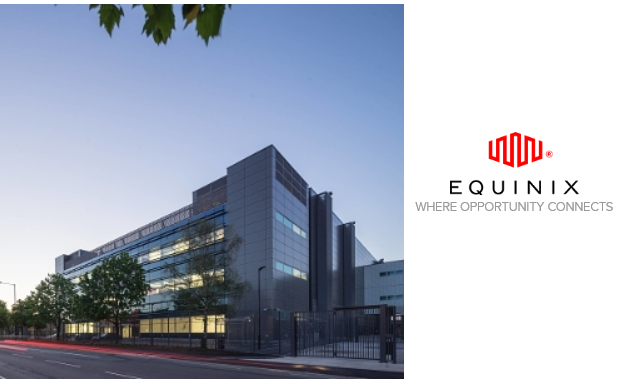 Peter Van Camp, who is executive chairman of the Equinix Board of Directors and who served as CEO of Equinix for seven years (2000 to 2007), will take up the post as interim CEO until a replacement is found. Verizon completed a field trial that delivered live 400 Gbps Ethernet traffic on a single wavelength between MPLS Core routers over its Packet-Optical network. The test, which was completed in December 2017 using the Verizon network in the Dallas area, carried between two Juniper Networks PTX 5000 routers across the Ciena 6500 Packet-Optical Platform. 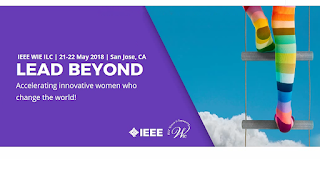 The 400 Gbps interworking connection complied with IEEE Standard 802.3bs-2017, which was ratified in December 2017. Verizon said the field trial marks an important step toward advancing 400 Gbps transmission and router technology – vital to the continued growth of services and applications such as video streaming, virtual reality and cloud computing. Snowflake Computing, a start-up based in San Mateo, California, announced $263 million in new venture funding to support its data warehouse business built for the cloud. The company said it is seeing a global surge in demand for Snowflake’s data-warehouse-as-a-service, which is now available across four AWS deployment zones. A big focus is on data analytics. The customer base grew by 300 percent in 2017. Notable accounts include Capital One, Lionsgate, Nielsen and Overstock.com. The new funding was led by ICONIQ Capital, Altimeter Capital and newcomer Sequoia Capital. Snowflake’s existing funding partners also invested in the round: Capital One Growth Ventures, Madrona Venture Group, Redpoint Ventures, Sutter Hill Ventures and Wing Ventures. With this round of funding, Snowflake’s pre-money valuation is $1.5 billion. Since its founding in 2012, Snowflake has raised a total of $473 million. Snowflake is headed by Bob Muglia, who previously was president of Microsoft’s $16 billion Server and Tools Business, responsible for products such as Windows Server, SQL Server, System Center and Windows Azure.